The last time I mentioned Photo Studio was in September of last year, when it was in a three-way battle against InstaPhoto and FilterLab. Looking at the comments, it appeared as though Photo Studio was the favorite. For a free application, it sure did pack a punch. It has over 60 various types of filters and effects to scroll through as well as options to reduce redeye or manipulate the image (resize, rotate or crop). The PRO version of Photo Studio gave you even more frames and effects to check out. Whether you pick up the free or PRO version, you’ll find that Photo Studio is one of the most robust image editing applications made available. The only thing that held me back from picking it as the winner at the time was the fact that I couldn’t easily share my photos; it wasn’t connected to any social apps like BBM. 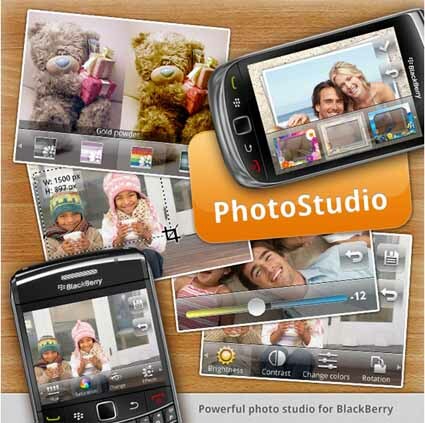 At the time, Photo Studio was in beta and has since been updated. Now, without leaving the application, you can share a BBM contact/Group or through social networking apps you may have installed. Speaking of updates, the application was currently updated to v.0.9.8.17. Check out what’s new. BM Connected, now you can share your photo directly from Photo Studio. New 55 frames in Christmas Pack 1 and Christmas Pack 2. New effects in Effects Pack (Sharpen and 6 Lens effects). New output formats: normal and large, save photos with better quality. Crop improvements with several selection modes. UI improvements, bug-fix and more.